The common cold is characterized by runny nose, sore throat, and cough, and may last 5 to 10 days. Colds, including chest colds and head colds, are caused by one of more than 200 viruses (rhinovirus, coronavirus, respiratory syncytial virus (RSV), etc.). The common cold is also very contagious. Over-the-counter cold and flu remedies can usually ease symptoms; your pharmacist can give you excellent advice on the best choice to help you feel a little better. While the common cold is caused by a virus, sometimes a cold can make it easier for you to catch a more serious bacterial infection, sinusitis, or even pneumonia (which can be fatal). 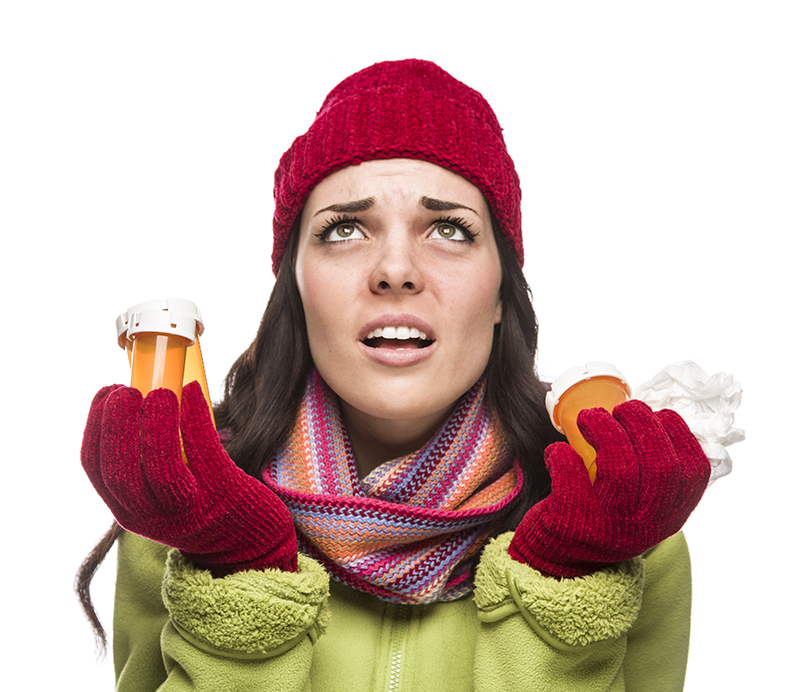 If your cold is not better in a couple weeks, call your primary care provider. If your cold starts getting better, but then you have recurrent fever, cough, and lots of sputum production, call your primary care provider. Flu is the short name for influenza and is characterized by fever, body aches, and headache followed by sore throat, cough and runny nose. Seasonal flu is caused by influenza A or B viruses. Influenza is much more serious than the common cold. Flu symptoms are much worse and the risk of getting a secondary pneumonia is higher, particularly for infants and the elderly. Recovery from influenza may take 5-10 days. Antiviral medications maybe helpful if prescribed within 24 hours after flu symptoms start. Most influenza can be prevented by a yearly flu shot, so get one every year! Talk to your primary care provider if you need more information or your symptoms don’t get better. Cover your mouth when you cough or sneeze to prevent spread of germs. Stay hydrated; healthy mucus membranes in your nose and throat help fight infection. Chill out! Psychological stress can increase your chances of getting a cold or flu. Talk to your primary care provider about ways you can reduce your stress and prevent colds, influenza, and gastroenteritis (stomach flu).